Tropicália, or Tropicalism, is one of Brazil’s most significant cultural movements. Born in the late 1960s by a collective of like-minded souls, it used music and visual arts as a voice to confront the cultural and political establishment. 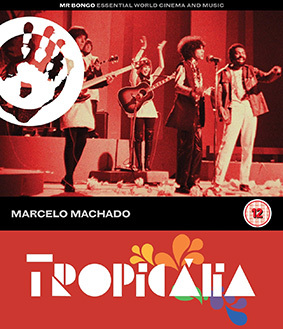 And now the scene and its key players are explored in Marcelo Machado’s fascinating new film Tropicália. This vibrant feature documentary explores this iconic and era-changing time in Brazil’s history with material lovingly gleaned from the archives, stunning images, and the testimony of the group’s protagonists including Caetano Veloso, Gilberto Gil, Tom Zé, Arnaldo and Sérgio Dias, from the band Os Mutantes, whose controversial thoughts, music and behaviour resulted in prison and exile for its leaders. Then of course there is the music, the "Tropicalistas" created pop songs, mixing traditional Brazilian folk and the north hemisphere’s rock which created a sound never heard before and which has since inspired and influenced many high profile musicians including David Byrne, Damon Albarn and Beck. Director Marcelo Machado grew up listening to the music and was inspired to document this influential, important scene in Tropicália, which comes to UK cinemas on 5th July 2013 followed by a DVD and Blu-ray release on 8th July 2013 from Mr Bongo Films at the RRP of £12.99 for the DVD and £14.99 for the Blu-ray. No extra features have been listed. We have a trailer, but no English subs for the Portuguese bits.